WILBERFORCE — The Rev. 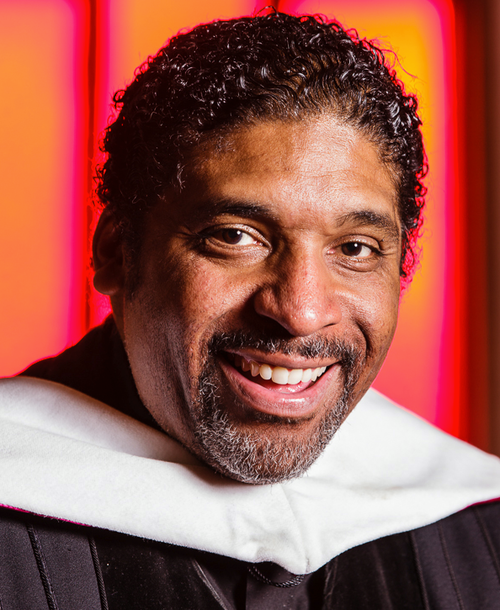 Dr. William J. Barber II, a pastor, social justice advocate, author, former president of the North Carolina Chapter of the NAACP, and a 2018 MacArthur Fellow, will deliver the Central State University 2019 Commencement address. Approximately 200 diplomas will be awarded during the ceremony, 10 a.m., Saturday, May 4, at the Dayton Convention Center. Barber is a contributing op-ed writer for The New York Times, CNN, MSNBC, and The Washington Post. Barber is a distinguished author and social justice advocate, has built a national grassroots movement, that crosses race, gender, age, and class lines to address poverty, inequality, and systemic racism. He is a phenomenal orator whose work and ideas inspire and motivate the nation to the greater good. As pastor of Greenleaf Christian Church in Goldsboro, N.C. (since 1993), and president of the North Carolina conference of the NAACP (2005–2017), Barber approaches social justice through the lens of the ethical and moral treatment of people as laid out in the Christian Bible, the Reconstruction and civil rights movements of the South, and the United States Constitution. When his work to expand voting rights, healthcare, living wages, immigrant rights, public education, and LGBTQ rights was thwarted by opposing groups and lawmakers in North Carolina, Barber began a series of “Moral Monday” rallies outside of the statehouse in Raleigh to protest laws that suppressed voter turnout, cut funding for public education, healthcare, and further disenfranchised poor white, black, First Nations, and LGBTQ communities. The Moral Mondays rallies and associated nonviolent acts of civil disobedience grew to involve tens of thousands of participants across North Carolina and spread to states across the South. The movement waged successful legal challenges to voter suppression and racial gerrymandering, winning twice at the Supreme Court. William Barber received a B.A. (1985), from North Carolina Central University, an M.Div. (1989), from Duke University, and a D.Min. (2003), from Drew University. He has also received seven Honorary Doctorates. He is also a distinguished visiting professor at Union Theological Seminary. Barber’s publications include the co-authored books “Forward Together: A Moral Message for the Nation” (2014), “The Third Reconstruction: Moral Mondays,” “Fusion Politics”, and the “Rise of a New Justice Movement” (2016), and “Revive Us Again: Vision and Action in Moral Organizing” (2018). He was the 2018 Tar Heel of the Year, an Auburn Seminary Senior Fellow, and holds the Visiting Social Justice Chair at St. John’s University.